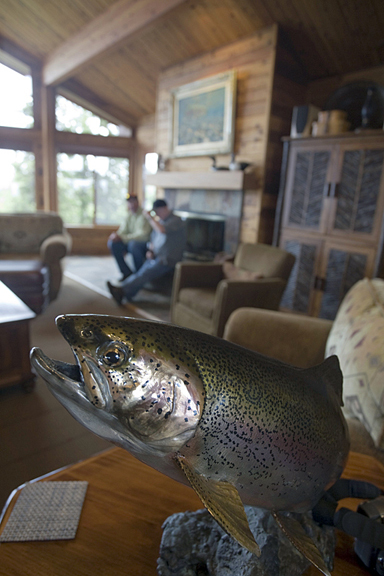 Shared double accommodations, all meals, complementary bar, seven day non resident fishing license, flying, guiding, use of all boats and motors, flies, and scheduled flights to and from the lodge and King Salmon on Sundays. If you request to arrive or leave at any time other than our scheduled flight, you will need to make your own arrangements to and from King Salmon. In order to secure date preferences, guests are encouraged to make their reservations at least one year in advance. A fifty percent deposit is required for confirmation. The balance is due sixty days prior to arrival at the lodge. Deposits received are non-refundable unless Enchanted Lake Lodge is able to fill the dates in question by another person or party. Alaska’s Enchanted Lake Lodge, Inc. will not be held responsible for any loss or injury to participants or for personal property or for any cancellation expenses or delays incurred as a result of weather, transportation, or by act of God. Enchanted lake Lodge reserves the right to withdraw and / or cancel any trip for the safe and proper handling of the excursion. All guests have the responsibility to disclose any special medical, physical or dietary needs to us. We recommend that you secure trip insurance. All rates are subject to change without prior notice, but will not affect any bookings previously confirmed. Making a reservation is easy. Just contact us by telephone or e-mail and we will assist you in finding the dates that work best for you. We are always available and look forward to assisting you in planning your next fishing adventure.